In March 2017, Playtech's Marvel slots licence expired and wasn't renewed by Disney – leaving a big gap in its video slot portfolio. However, like every good superhero, the brand took action. It created something to save the gamer from their impending doom – the Age of the God slot series, containing of King of Olympus, Furious 4, Prince of Olympus and Goddess of Wisdom. Age of the Gods: Goddess of Wisdom has been heralded as one of 2017's most exciting progressive jackpot games. Featuring the goddess Athena over five reels and 20 paylines, plus free spins, bonus multipliers and four progressive jackpots, it's guaranteed to make Marvel games no more than a nostalgic memory. 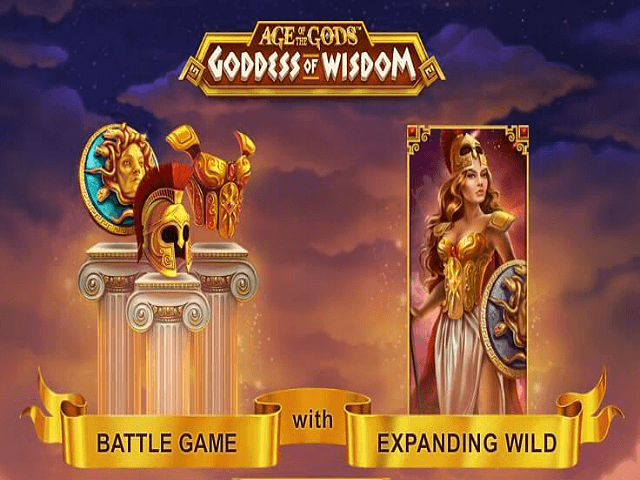 Play Age of the Gods: Goddess of Wisdom Slot Demo for Free! Play Age of the Gods: Goddess of Wisdom for Real Money! 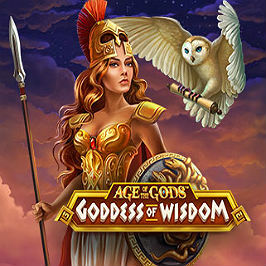 Age of the Gods: Goddess of Wisdom slot comes to gamers from one of the casino industry's biggest names: Playtech. It takes players into the mythical world of the ancients, where gods and goddesses are revered by the masses and wield supernatural powers. This time around, our heroine is Athena – the goddess of wisdom, courage and war. This beautifully rendered game does the Age of Gods series proud, featuring a high-end slotscape, with a sacred temple complete with giant marble columns. Within the reels, gamers can enjoy spinning for a range of icons, including olive leaves, sandals, warrior helmets, breastplates and the fearsome snake head of the underworld's Medusa. Athena herself is the wild, substituting for all other symbols apart from the White Owl scatter. The game has stunningly eerie audio and a fair return-to-player ratio of 94.94%. 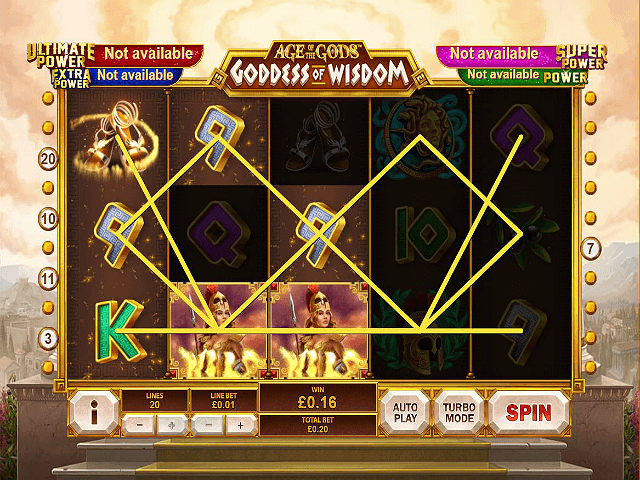 Goddess of Wisdom slot is easy to launch. 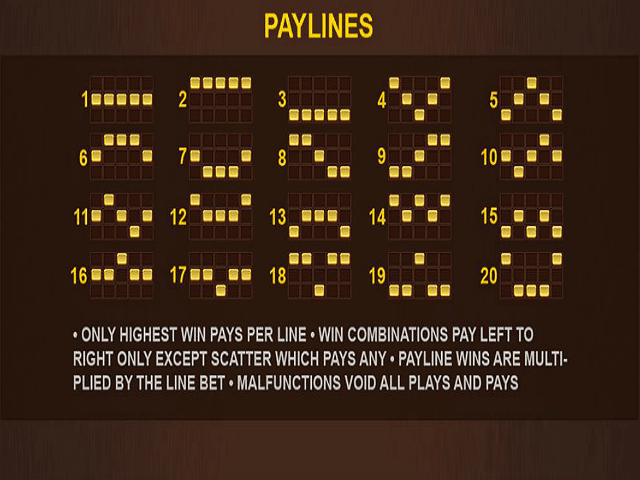 All players need to do is choose a coin value and line number, then click to play. Bets can be made from 0.20 to 500 or 1000 depending on the casino. The video slot has a maximum jackpot of 5000x, plus a progressive jackpot feature. The interactive element of the game enables casino players to get strategic. Although the snake-headed Medusa reward doesn't contain a multiplier, the trade off comes by virtue of what happens during the bonus spins: the other two symbols are eliminated from the reels. Medusa is the highest value icon, paying out 5000 coins for a five-symbol combination. Players therefore trade a win multiplier for a higher paying icon and vice versa. Wilds also feature in the bonus round – completing any reel. Age of the Gods: Goddess of Wisdom is linked to four progressive jackpot pools. As they can be randomly triggered on any spin, winners have everything to play for when it comes to the jackpots. You must select gold coins until three match and activate which jackpot is won. Lovers of the now obsolete Marvel video slots won't be disappointed by this more than adequate replacement in the form of Age of the Gods: Goddess of Wisdom. Share this Age of the Gods: Goddess of Wisdom Review today! 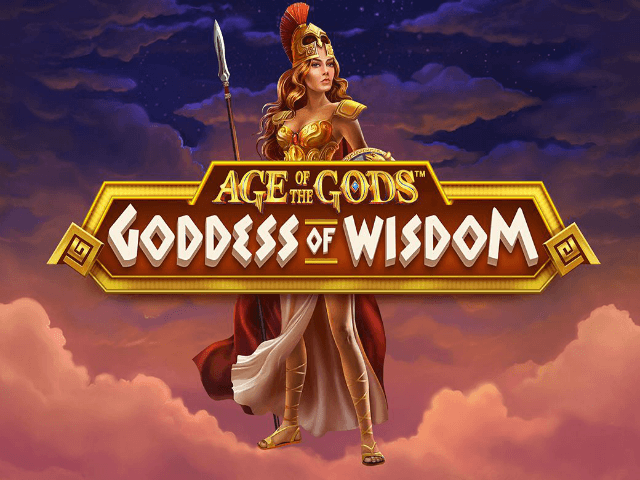 If you like Age of the Gods: Goddess of Wisdom, you'll love these slot titles too!